I don’t think I’ve had a choc-ice since primary school. I’d forgotten the joy of the thin chocolate cracking as you chill your teeth on the ice cream. I wanted to make a dairy-free ice cream, not because I have any particular needs, more to try other ingredients. Coconut milk is rich and thick enough to work and it comes with its own ready-made flavour. You can infuse it with whatever additional flavours you like and here I’ve used matcha green tea and cardamom as well as adding a little cheeky pinch of chilli and salt into the coating. The joy of recreating ‘Ice-Magic’ at home is so easy and such fun (it also only has two ingredients in it when it’s homemade). Watch it freeze as it hits the ice cream. And using coconut oil with the chocolate makes sense. If the amounts of syrup and matcha in the ice cream seem a little much, remember that freezing things softens their flavours. If you have an ice cream machine, great. If not, you’ll have to whisk the mix every hour as it freezes to prevent ice crystals forming. Some machines require the bowl to be frozen overnight, so make sure you’ve done that. Pour the coconut milk, cardamom, maple syrup and matcha into a heavy-based saucepan and bring to just below the boil. Whisk well to dissolve the tea and prevent it turning lumpy. Add the arrowroot powder, and whisk while heating for a few minutes until the mixture becomes thick enough to coat the back of a wooden spoon. Just like custard. Chill in the fridge for about 3-4 hours then churn in your machine until you have ice cream. Pour into a rectangular container and freeze for another few hours to harden. 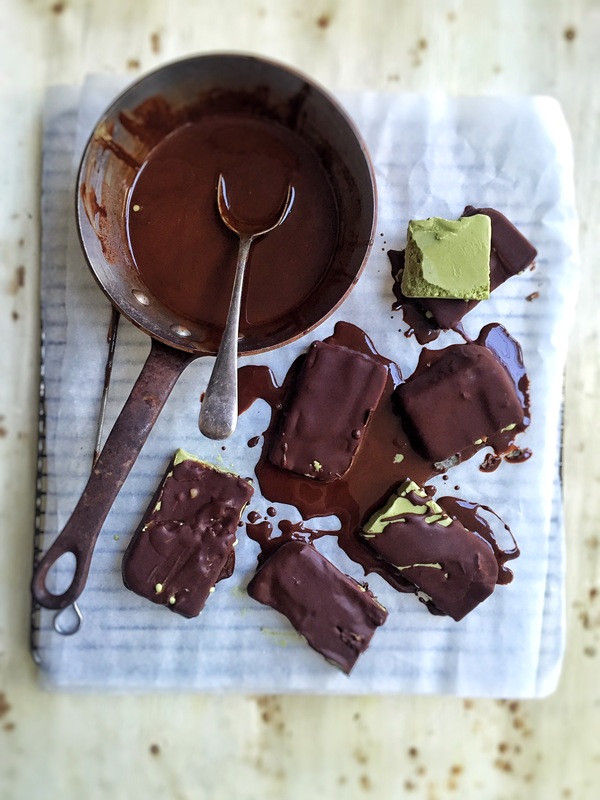 Cut the ice cream into bars, coat well with the chocolate (I use a skewer to dip them) and keep in the freezer unless you’re eating them immediately. Which I did. Use this method and recipe to make other flavours with vanilla seeds, orange extract, cocoa, pandan, or whatever takes your fancy.